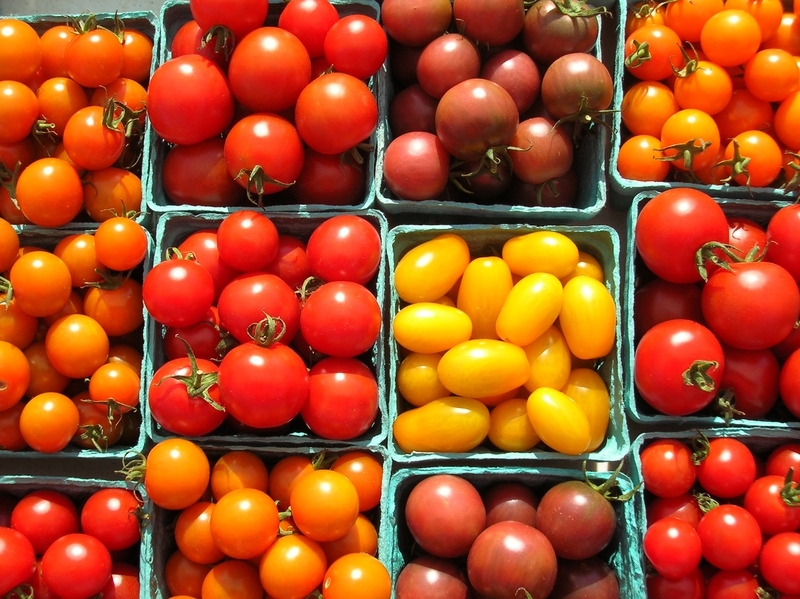 How Does Cherry Tomatoes Benefit Us? Cherry tomatoes are just like normal tomatoes but they are small in stature. Cherry tomatoes are found in numerous sizes, shapes and colors. You can find cherry tomatoes in orange, yellow, black, pink and white colors besides red ones. Even though they are small, they are sweeter than large sized tomatoes and have a number of nutritional benefits to offer. This flavorful and healthy tomato can help you avoid a number of ailments. People struggling with weight gain issues might consider eating cherry tomatoes instead of large ones because it contains fewer calories than them. However, before you start eating cherry tomatoes, you might want to find out how many calories in tomatoes. Each calorie you get from cherry tomatoes is comprised of 9% fat, 16% protein and 75% carbohydrate. Protein and Carbohydrates: Depending on your lifestyle, you must intake around 46 to 56g of protein on a daily basis. Each cherry tomato has 0.67g of carbohydrates and 0.15 proteins to offer you, for ten cherry tomatoes you will gain 6.7g carbohydrates and 1.5 proteins. Consuming 130g of carbohydrates is recommended by the Institute of Medicine. Therefore you can add some food Pregnant women and athletes require more carbohydrates and need to check with their doctor to find out how much carbohydrate they must take. Minerals and Vitamins: Usually, a serving of cherry tomatoes includes 22 cherry tomatoes. You can get 2% of the recommended amount of iron by eating 5 cherry tomatoes. Recipes that have cherry tomatoes or snacks made from cherry tomatoes are enough for fulfilling your daily vitamin A needs. You can get up to 15% of the amount of vitamin A you need daily from one serving of cherry tomatoes. Since they are excellent sources of vitamin A, cherry tomatoes can help you in boosting your immune system and maintaining your eye health. Cherry tomatoes also contain vitamin C in abundance. You get around 10% of the daily recommended intake of vitamin C from one serving of cherry tomatoes. Cherry tomatoes are rich in lycopene. It is an antioxidant that keeps you safe from contracting diseases caused because of cellular damage. According to an article in the 2000 edition of the Canadian Medical Association Journal, lycopene can reduce the risk of cancer and cardiovascular disease. Cherry tomatoes can provide even more lasting benefits for your health as well. An article published in the 2010 edition of the American Journal of Lifestyle Medicine states that compounds present in cherry tomatoes can protect you from brain disorders, osteoporosis and ultraviolet light skin damage. After knowing the answer of how many calories in cherry tomatoes, why not make a healthy cherry tomatoes recipe? 1. Start with toasting the slices of bread in a toaster. 2. While the bread toasts, get the avocado flesh out in a bowl. 3. Add the pinch of salt and lime juice to the bowl and mash all of it together until the mixture is smoothed out. 4. Spread the avocado mixture on top of the toasted slices of bread. 5. Arrange the cherry tomatoes on top of the slices and serve.